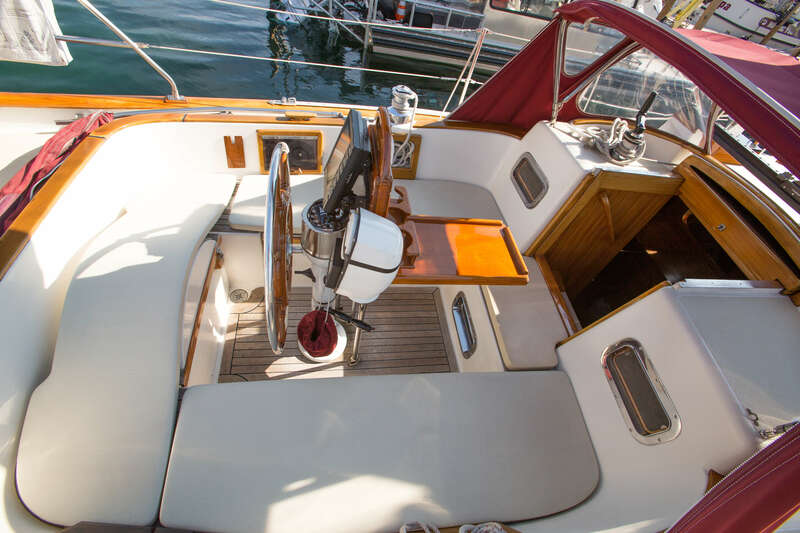 The classic yacht Scout will whisk you away on a luxurious private 2.5 hour sunset cruise, followed by a romantic dockside overnight with this stunning vessel all to yourselves! Awake in the morning to a full breakfast. In addition to Scout's accommodations you will have full access to CenterPointe Marina shower/bathroom and boaters lounge facilities. This is an unforgettable experience! Enjoy a three-hour sunset sail aboard Scout followed by a romantic night tucked away at our dock in Center Pointe Marina. After returning from our sail the crew departs, leaving you to enjoy a private and peaceful night afloat. Walk down the dock to enjoy an evening cocktail at West End Tavers, head to town for a little night life, or just enjoy the tranquility of life aboard your yacht. Awake in the morning to a full breakfast served on board. 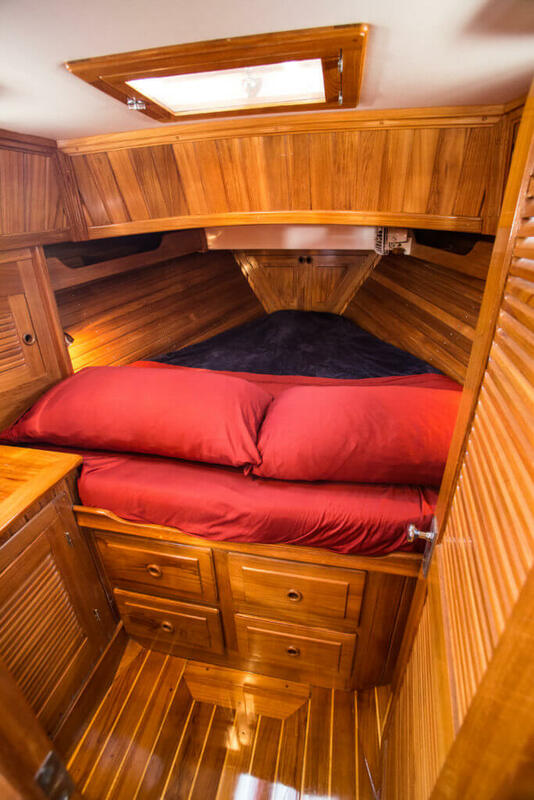 Scout can accommodate up to two people in two cozy double cabins. Stepping down below you are instantly immersed in a symphony of light colored teak. There is a head (bathroom) and shower, plus you have access to the marina bathroom/shower facilities and lounge. 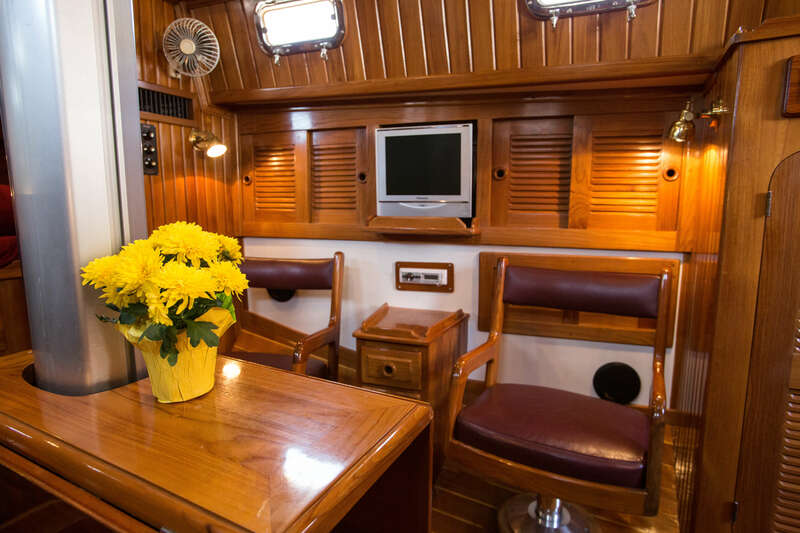 Amenities include: Flat screen TV with DVD player, stereo system, and full galley, including refrigerator stocked with soft drinks. 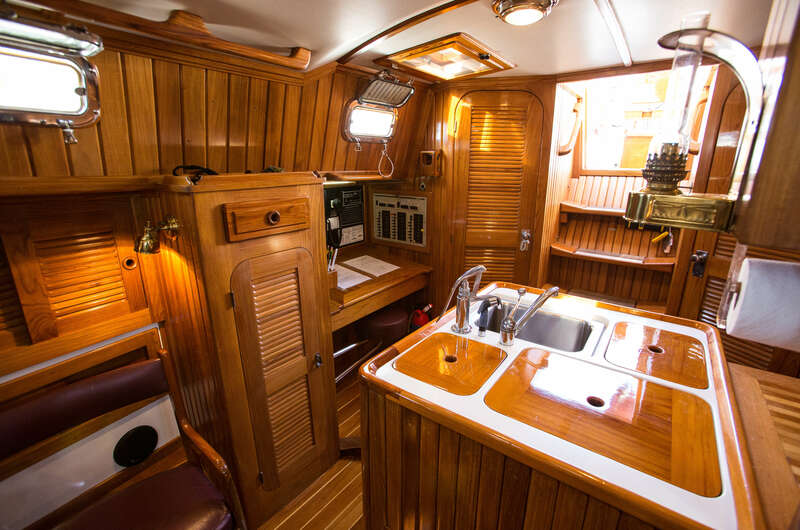 graceful clipper bow and wood deck trim to a stunning symphony of honey-colored teak (all sustainably plantation grown) below decks she will take your breath away. The brainchild of legendary naval architect W. I. B. Crealock, this vessel has won a reputation for soft motion and stout offshore performance. Whether you prefer sipping a drink under the shade of the cockpit Bimini top, lounging below, or stretching out to sunbathe on deck, there is plenty of room for your group. Scout is well stocked with complimentary snacks, fruit and non-alcoholic beverages. We even have Moomers Ice Cream in the freezer! 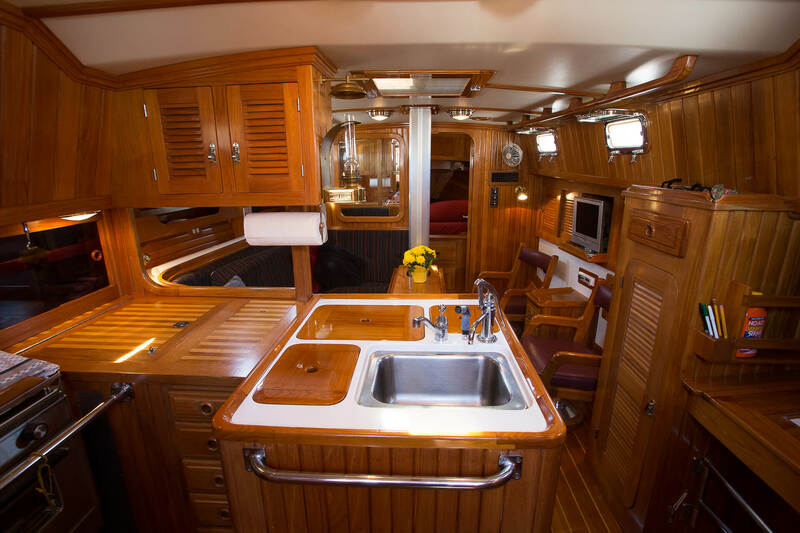 There is also plenty of refrigerator room to store any alcoholic beverages you would like to bring aboard. If you would like to add dinner to your sunset sail, we have a full catering menu to choose from, or feel free to bring your own. Scout is just minutes away from some of the best microbreweries in Michigan including: Right Brain, The Workshop, Rare Bird Northpeak and Brewery Terra Firma, to name a few. Take advantage of our Wine and Water Tour and you combine two of the best Traverse area activities. 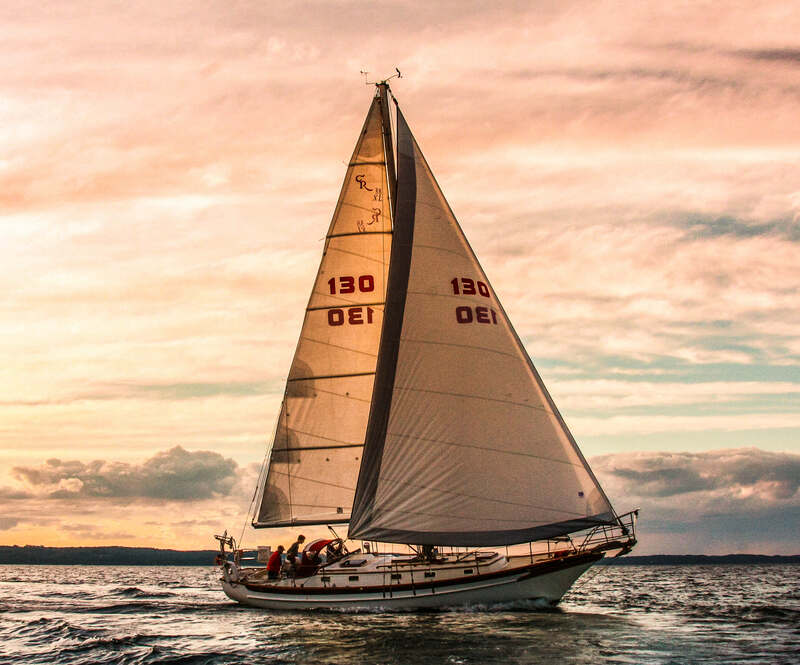 Enjoy a four hour wine tour with Traverse City Tours followed by a sunset sail and overnight aboard Scout. Click here and scroll down for more information. Don't just look at the bay, get out there and experience it from the deck of a luxurious yacht. Scout's overnight package includes a 2 1/2-hour sunset sail after private overnight in CenterPointe Marina, with the boat all to yourselves. A full breakfast is delivered to you in the morning. Help set sail, take a turn at the wheel or just sit back and relax during your sail aboard Scout. We are also minutes away from Traverse City's TART Trail (great for biking!) as well as standup paddle board and kayak rental facilities such as: The River Outfitters, or Paddle TC. 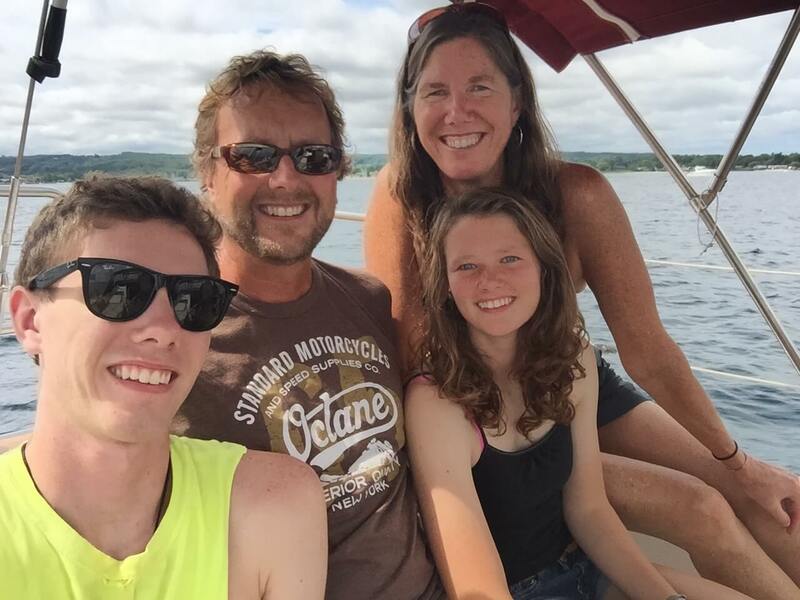 For those who would like to get some beach time in before or after your stay aboard Scout, we are a five-minute drive from Traverse City's beaches. And of course no one should visit this area without a short side trip to Sleeping Bear Dunes National Lakeshore. With its miles of unspoiled beaches, peaceful hiking trails, and spectacular scenic drives, it's no wonder this park was named Most Beautiful Place in America! Sailing Yacht Scout's overnight package offers the ultimate romantic getaway. Take a private sunset sail, just you and the crew. Upon our return to Scout's berth the captain gets you oriented and "tucked in" for the night before leaving you in privacy. In the morning a homemade full breakfast will be delivered to you. Scout is just minutes from downtown Traverse City, one of the most vibrant and exciting communities in the state of Michigan, and named on countless top 10 city lists nationwide. A true foodie destination, the Traverse City areas is bursting with top notch restaurants, microbreweries, and wineries. And lets not forget the vibrant art and music scene. The world class acts performing at Interlochen Arts Academy and the ever more popular Traverse City Film Festival are just two highlights of a region brimming with cultural as well as outdoor activities.